That’s a shame. It would have injected some more levity into the primary. Barrett’s statement puts to rest six weeks of public speculation on whether he would make another bid for the guv’s office. While Dem guv candidates have struggled to break away from the crowded field financially, Barrett had $621,983 in his campaign account at the end of 2017, more than twice what any of the top-tier contenders had in the bank to end the year. Still, Barrett, 64, had done nothing publicly to lay a foundation for a run ahead of today’s announcement, which comes three days before candidates have to turn in at least 2,000 valid signatures to make the ballot. He also has faced questions on whether he could beat Gov. Scott Walker in the general election after losing to him in 2010 and the 2012 recall. I suspect that we will see several of the Democratic candidates pandering to Barrett to try to get some of that campaign cash. I suspect that this is just the result of liberal journalists sitting around bemoaning the weak field of Democrats already running, but I would LOVE to see Barrett run again. Mayor Tom Barrett weighs another bid for governor: Daniel Bice of the Milwaukee Journal Sentinel writes: “He has more than $600,000 in his campaign account. The competition is weak and frayed. And the job is one he has long coveted. Yep, Mayor Tom Barrett is thinking about running for governor. For a fourth time. Sources confirmed this week that the fourth-term mayor has been sounding out his team of advisers about entering the Democratic primary for governor later this year. If Barrett enters, he would likely become the immediate favorite in the Democratic field. It would be a bruising primary battle between the Mayors of Madison and Milwaukee with Tony Evers tag-teaming in for both sides. Barrett has moved from a benign caretaker mayor of Milwaukee to one that is precipitating the city’s decline. MILWAUKEE — Significant cuts to the police and fire departments. That’s what the city of Milwaukee faces as Mayor Tom Barrett prepares to unveil his 2018 budget Tuesday, September 26th. The mayor’s office said the original budget proposal had more drastic cuts to public safety, and they said the mayor did his best–still this isn’t popular with many people. The mayor’s budget proposal to include cutting 33 police officer positions and 75 firefighter slots is not popular with many. “I don’t want to have fewer police officers next year. But in order for us to avoid that, we’re going to have to have a sales tax,” Mayor Tom Barrett said. The property tax levy is also slated to go up by 3.7 percent. The city is faced with lead issues in the water, replacing leaking pipes and laterals connected to water mains. Police and fire pension payments are skyrocketing as more retirements loom. So there’s no money for police, fire fighters, fixing the city’s lead pipes, etc., but there is plenty of money for a downtown trolley, the mayor’s staff, employee benefits, etc. Milwaukee has plenty of money. The problem is that the city’s leadership has idiotic priorities. Unfortunately, this looked doomed from the start. MILWAUKEE (CBS) – An attempt to recall Milwaukee Mayor Tom Barrett has failed, according to the City Election Commission. The Commission says the Milwaukee Can’t Wait group did not get the required number of signatures. The City of Milwaukee is more unique than we knew. It is the only city its size limited to using property taxes as the sole form of local taxation, a new report has found. 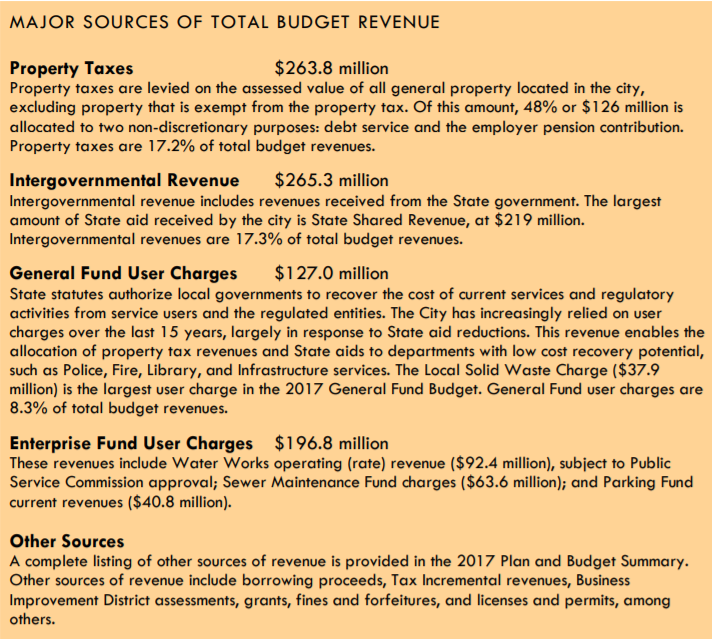 The report also suggests the current revenue structure Milwaukee is required to operate under is ineffective and outdated. “Milwaukee is in this unique situation because the handcuffs are so tight,” Mayor Tom Barrett said in an interview with the Milwaukee Journal Sentinel. The report — “On The Money?” — will be released Sunday by the nonprofit Public Policy Forum. Following an analysis of 39 similar-size cities, the forum found Wisconsin is the only state in the Midwest that limits municipalities to the property tax as the sole form of local taxation. And it’s the only state whose largest city has the same tax structure as all other municipalities. 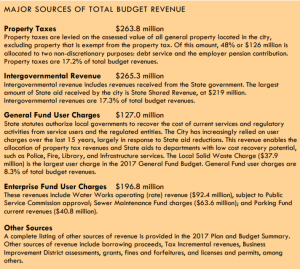 The analysis also found that each of the cities studied in the report except Milwaukee has multiple taxes, and most have general or selective sales taxes, such as taxes on entertainment or food and liquor. Other findings include that state aid is typically a minor source of revenue for most of those cities, and cities with larger populations tend to draw more heavily on the sales tax and less on the property tax. You will also notice, that Barrett is very specific about talking about “taxation” since the City does rake in a tremendous amount of money through various fees like the Wheel Tax – er… Wheel Fee. Barrett wants to continue to receive a tremendous amount of money from the state, but also wants to raise more local taxes to support his reckless spending. But it is really a matter of the philosophy behind how we want to fund out local governments. I have long been a critic of Wisconsin’s Shared Revenue structure. I would much prefer to scrap the entire framework, cut state taxes and spending, and let local people decide for themselves how much they want to fund their local governments. It has never made sense to filter so much tax money through the state and back to local governments. Except in the cases of some rural local governments that lack a sufficient tax base, the state shouldn’t be in the business of funding any local governments. So I support Barrett’s effort to allow local governments to levy more and different kinds of taxes to fund themselves – as long as the rest of Wisconsin’s taxpayers can have back the $265 million per year that we send to Milwaukee. The state sends about a billion dollars a year to local governments. Let’s return that to the taxpayers and let local taxpayers decide how they want to fund their local governments. Have you ever noticed how politicians like Mayor Tom Barrett will recklessly spend money on stupid stuff, but when the money runs out they only threaten to cut vital public safety? For example, Barrett is making it clear that if he has to choose between funding a non-vital trolley for a few downtown dwellers or cutting police for the rest of the city, he will protect his trolley. Budgets are about choices and Barrett is making his. The City of Milwaukee could be forced to cut 84 police officer positions in next year’s budget, Mayor Tom Barrett said. “I view all of this in the context of public safety and, actually, crime prevention in many respects,” Barrett said. The same mayor who is insistent that taxpayers spend hundreds of millions of dollars on a street car as a novelty attraction for his wealthy downtown patrons is telling the citizens that their water might be contaminated with lead. Mayor Barrett’s priorities are so inverted that he has failed to fulfill one of his most basic responsibilities as a mayor – maintaining a safe and reliable primary infrastructure. Owners and residents of tens of thousands of City of Milwaukee homes built before 1951 should install faucet filters capable of removing lead from drinking water, Milwaukee Mayor Tom Barrett said Wednesday. “I strongly urge anyone who lives in a home built before 1950-’51 to get a filter,” Barrett said at a public forum on drinking water held at Marquette University Law School. About 70,000 city residences, including duplexes, or nearly 45%, of the total, receive water from street mains through a lead pipe known as a lateral. Although Milwaukee treats Lake Michigan water to control corrosion of lead from those pipes and prevent contamination of drinking water, this step is not a 100% guarantee of clean water, a drinking water treatment scientist said Wednesday. “As long as the lead pipe is there, no one should consider the water safe” to drink, said Marc Edwards, a professor of environmental and civil engineering at Virginia Tech. Edwards has led independent investigations of lead contamination of drinking water in Flint, Mich., and Washington, D.C.
“Zombie houses” are homes abandoned by their owners, but unwanted by the banks. Currently, banks are forced to put a “zombie house” up for sale five weeks after the home is found to be abandoned. A new bill would move the deadline back to 12 months, and it has already made it through the Assembly and the Senate. I ask out of honest ignorance… who benefits from changing it to 12 months? I would think that the banks would want to get it sold and off their books as soon as possible. And the city certainly wants it sold. But surely somebody asked for the change for their own benefit. Who? Why? This was expected. While it’s good that utility rate payers won’t be stuck with the bill for Barrett’s Folly, the taxpayers will be. The city would be left to pick up the $10 million to $25 million tab for utility relocation costs linked to the Milwaukee streetcar project under a judge’s decision. The decision, issued Thursday by Milwaukee County Circuit Judge William Sosnay, said it was unreasonable to require utility companies to pay any part of the costs for relocating or modifying their lines to accommodate the streetcar. The ruling agreed with an earlier decision by the Public Service Commission of Wisconsin in the utility dispute, which said the city — not utilities and their ratepayers — should pay for moving underground utility lines along the streetcar route. Let’s see… they advocate lenient sentencing – particularly on juveniles – and enact a “no chase” policy for stolen cars. Did they not expect any consequences? Just heard on the Jay Weber Show, Clarke is not going to run against Tom Barrett. Clarke was widely seen as one of the few potential candidates who could unseat the incumbent mayor. Clarke’s decision not to run makes Barrett’s reelection chances very, very good. Tom Barrett sent an email to potential contributors Tuesday morning officially announcing his bid for re-election in 2016. Barrett was first elected mayor in 2004 and was re-elected with more than 70 percent of the vote in both 2008 and 2012. The Democrat lost to Republican Gov. Scott Walker in a historic recall race in 2012. In his email, Barrett says he’ll work to create more family-supporting jobs and continue the battle against gun violence and build partnerships between police and the neighborhoods. Can anyone make a rational argument for Barrett’s reelection? He’s been the mayor for over a decade and what are the results? Crime is bad. The population is declining. Taxes and fees are up. Barrett hasn’t been responsible for any major new economic development. I suppose you could credit him for a piece of the new arena for the Bucks, but that was mostly driven by other folks. MMSD is still dumping poop into the lake. Milwaukee may soon become one of the largest cities in the United States to outfit all of its patrol officers with body cameras under a proposal by Mayor Tom Barrett. The mayor said on Sunday that he will include in his preliminary city budget a proposal to spend $880,000 to equip all of the city’s 1,200 patrol officers with body cameras by the end of 2016. “I want our police officers to be in a position to demonstrate beyond a reasonable doubt that they are acting professionally,” Barrett said during a news conference. Many U.S. cities have taken interest in supplying body cameras to their police departments after a series of widely publicized shootings by white police officers of unarmed African Americans over the last couple of years. But the cost of body cameras, which can run from $350 to $700 apiece, has hindered widespread adoption in many cities where budgets are tight. The cost of supplying body cameras to all Milwaukee patrol officers and video storage would increase to about $1 million in 2017, the mayor said. In general, I think body cameras are a good idea. The technology is such that it is relative light and inexpensive. But many of the details still need to be worked out to balance privacy concerns for the police and the public. Also, body cameras are not a panacea and should not be viewed as such. They will offer one more piece of information to consider when evaluating a police officer’s interaction with a member of the public – or a member of the public’s interaction with a police officer. Body cameras are, however, another thing that adds to the cost of a police force. That cost needs to be weighed against any potential benefit outside of a mayor pandering to the anti-police community before his reelection campaign. MADISON, Wis. – Hundreds, maybe thousands, of Milwaukee criminal cases could be compromised due to a malfunction in January of a contracted video system used for capturing interviews and confessions of suspects, multiple sources tell Wisconsin Watchdog. Among the interviews lost is that of Darmequaye D. Cohill, 21, who was charged in January with first-degree reckless homicide and first-degree recklessly endangering safety, both offenses with a dangerous weapon, in connection with the shooting death of a 13-month old boy. Michael Crivello, president of theMilwaukee Police Association, and James Toran, the Milwaukee lawyer who previously served as Cohill’s defense attorney, confirm that the Milwaukee Police Department’s Tracer “video interview solution” system went down in January, not long after Cohill was arrested. The system is provided by MediaSolv Solutions Corp. Perhaps thousands of interviews and confessions of suspects have been lost, and many cannot be retrieved. Sources in the police department’s homicide and drug investigation units say that because confessions have disappeared, the Milwaukee County District Attorney’s office has been pleading down felony cases to much lesser charges. A few questions come to mind… First, this happened in January and we are just now finding out about it? And it is worth noting that we get this huge story from the alternative media – not from Milwaukee’s only newspaper or from Milwaukee public officials. Several sources say the Milwaukee PD begged the city for more funding for additional storage and data backup last year because the system was reaching critical overload. The funds were denied, sources say, and within months the entire system crashed. A spokeswoman from Mayor Tom Barrett’s office did not return a call seeking comment Monday. Third, where are Milwaukee’s elected leaders on this? This happened 5 months ago, criminals are not being held accountable for their crimes, and everybody is just pretending like nothing is wrong? This is a major screw up that could have been avoided that is damaging hundreds of criminal cases. Someone is responsible and the public needs to know who. I’m having a hard time not concluding that Mayor Barrett is just a raving mad on this issue. The Democratic mayor called for policy action, in the form of more state resources to combat gun crime in Milwaukee. “I don’t want to lock up more people who are carrying a nickel bag of marijuana, but I do want to lock up more people who get involved in gunfights in parks, on streets, outside taverns,” the mayor said. I’m sorry, but it is now legal for people to get in gunfights in parks, streets, and outside taverns (apparently gunfights inside taverns are taboo)? Last time I checked, that was already illegal. How would more gun laws help? Barrett is also railing against concealed carry, but I haven’t seen it reported that a single one of the Milwaukee murders was committed by someone legally carrying a gun and illegally using it. One of the most egregious, the murder of a driver and teen, was allegedly committed by a felon who was on parole. He was breaking several laws by possessing a gun. There might be a few tweaks to our gun laws that make sense, but they are not going to fix the violence in Milwaukee. The mayor of that city, Tom Barrett, is failing in his job to protect the citizens of his city and he is desperately seeking to deflect blame elsewhere. Congratulations, Wisconsin. Today was a healthy bipartisan spread of stupid decisions that will hurt the state for years to come. First, Governor Scott Walker reaffirmed his decision to turn away thousands of private sector jobs and over a billion dollars in private economic development despite an offer by the Menominee to essentially indemnify the state taxpayers for any possible losses that may result from building the Kenosha casino AND give $220+ million to build a new arena for the Milwaukee Bucks. With that decision, Walker also made it exceedingly difficult to pass any state funding bill to help build a new arena for the Bucks. Many people from outside Milwaukee already opposed taxpayer support for an arena, and now they likely won’t support a dime of my tax dollars going to build an arena in Milwaukee since Walker is turning down over $200 million in private funding for that project. Walker’s decision makes it quite unlikely that Wisconsin will have an NBA team in 36 months and all of that private investment and economic activity will leave the state too. To cap it off, Mayor Tom Barrett finally got his trolley in Milwaukee, thus obligating the taxpayers to hundreds of millions of dollars of taxpayer expense for decades to come.